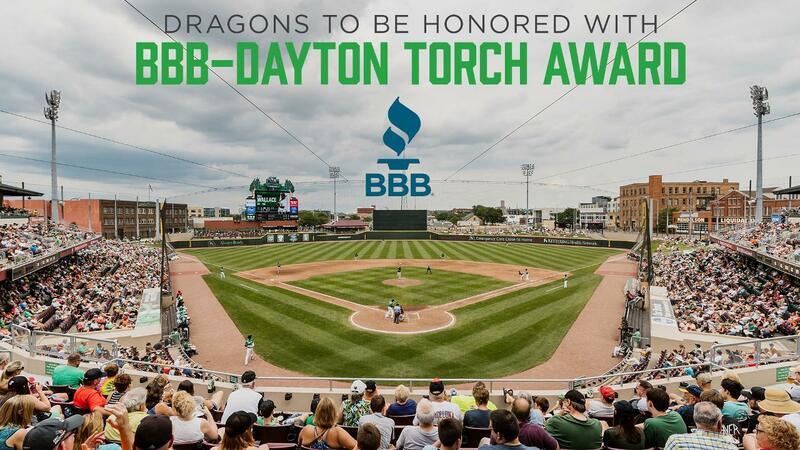 DAYTON, OHIO-The Dayton Dragons have been selected to receive the 10th annual Torch Award presented by the Better Business Bureau serving Dayton and the Miami Valley. The Dragons will receive the prestigious honor at BBB's Eclipse Integrity Awards on Tuesday, May 14 at David H. Ponitz Sinclair Center, 444 W. Third St., Bldg. 12, Dayton. Through the years, BBB's torch has been the symbol of guidance and enlightenment as consumers and businesses strive to interact in a trustworthy and ethical marketplace. The local Torch Award is dedicated to the legacy of great Miami Valley business pioneers, such as John Patterson, Wilbur and Orville Wright, Charles Kettering, Colonel Edward Deeds and most recently, Clay Mathile. It was through their ingenuity, leadership, generosity and mentorship to others the Miami Valley has stood the test of time and recreated itself again and again. John North, president and CEO of the BBB serving Dayton and the Miami Valley, says, "This minor league baseball team has made a major impact on the Dayton Region. Not only has the organization had record-breaking attendance at the games, it's also made giving back to the community a mainstay within its culture. This is also not the first time the team has made it into the BBB spotlight. It's won the BBB's Eclipse Integrity Award twice - once in 2001 and again in 2002. As it celebrates its 20th season in the Miami Valley, we're thrilled to honor it with the prestigious Torch Award." "We are deeply honored to receive the Torch Award from the Better Business Bureau," said Robert Murphy, president of the Dayton Dragons. "The Dragons are proud to be a part of the fabric of this community and from the beginning we've made it a priority to give back. What a great way to kick-off our 20th season in Dayton and celebrate our commitment to excellence, leadership, integrity and customer service." "The selection committee believes the Dayton Dragons are a natural fit for this year's honor. The Dragons have worked tirelessly for the last two decades to provide a world-class, sports-entertainment experience to everyone it comes into contact with. As a result, it's been the #1 attended team in all Class-A baseball for 19 years and has routinely finished in the top ten of all attendance out of 160 Minor League Baseball teams. "The organization takes giving back to the citizens it serves very seriously and has supported many community-related projects. A few examples of this stewardship include its Hometown Heroes program, which hosts nearly a hundred military families at games, to Home Run For Life, a program that treats those that overcame significant medical events to a VIP experience at a game. It even hosts various health-focused nights on its plaza, hosts multiple charity walks and supports over 500 charity groups throughout the community. "The team's commitment to the region is unwavering. The Dragons are members or sit on boards of the following groups: Dayton Area Chamber of Commerce, Downtown Dayton Partnership, Dayton Development Coalition, Walk To End Alzheimer's Committee, Catholic Social Services of the Miami Valley, BizWomen Insider's Club, Girl Scouts of Western Ohio and 16 local chambers." The public is invited to attend the Eclipse Integrity Awards on May 14. For reservations and to purchase tickets, call (937) 610-2277.